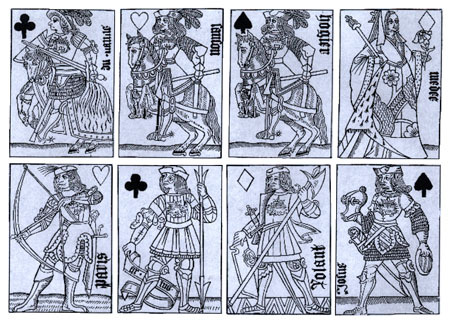 French cardmakers, c. 1470, invented the familiar suit signs of Spades, Hearts, Clubs and Diamonds (which the French call Spearheads, Hearts, Trefoils and Squares). The first three are presumably adapted from the German Leaves, Hearts and Hawk Bells. The first European cards, like their Mamluke models, were hand-painted and therefore reserved for the nobility who could afford to hire special designers and craftsmen. Surviving examples of such cards are of generous size and lavish handiwork in delicate colors on backgrounds of gold, silver or floral tracery. Popular demand led to mass production through the new technique of the woodcut. Designs for whole sheets of cards were drawn and carved on woodblocks, then inked and printed on paper, finally separated and glued on cardboard. Woodcut cards, including the suit signs, were rendered carefully with shading and detail. When the fifteenth-century French designed the modern suit signs, card manufacture was greatly simplified. Spades, Hearts, Clubs and Diamonds, rendered as flat silhouettes in only black and red, no longer required carved blocks but could be quickly and cheaply made from ordinary stencils. This efficiency gave French cardmakers an advantage over all others. A notable printmaking center was Rouen, France, and from this city cards were imported by the English. Thence, by stages, the same designs reached the American colonies, the entire U.S.A and the world.